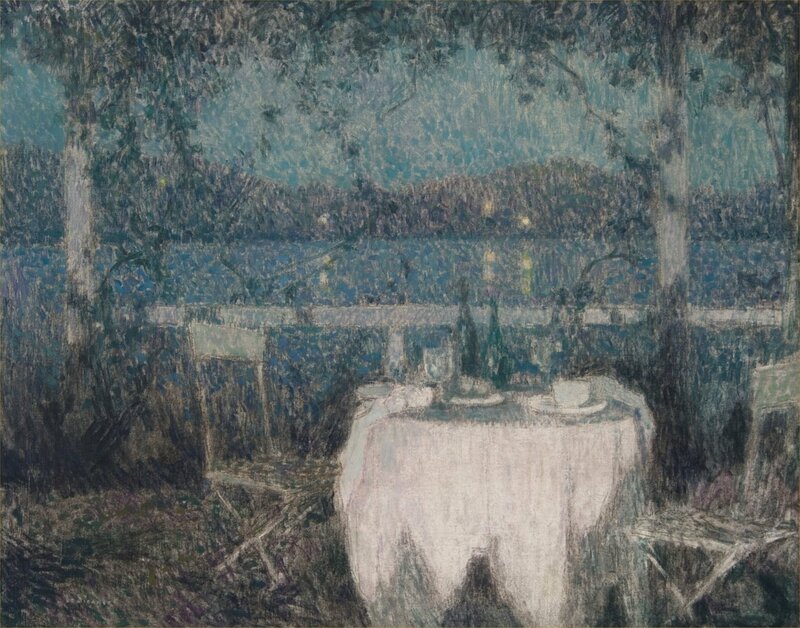 The master of penumbra Le Sidaner beautifully demonstrates in La Table sur la terrasse au clair de lune, the ‘crepuscule’ of velvety darkness so soft and thick you could almost touch it, illuminated by a ‘clair de lune’. It was for paintings such as these which explore the light effects at dusk or in the mist, that Le Sidaner was to become so widely known. Le Sidaner has been described as ‘the last of the Impressionists’, he was a considerable admirer of their work and clearly influenced by them and their use of light and their approach to nature. In 1891 he first exhibited in Paris at the Salon des Artistes Français where he was awarded a bronze medal at the Universal Exposition, one of a number of awards that the artist was given during his lifetime. Between 1924 and 1928 the painter stayed at the Hôtel Welcome, in the heart of the old harbour in Villefranche-sur-Mer, a small town of about 7,000 inhabitants, famous for its splendid bay on the French Riviera, where this painting is set.